Ninja takedown Wednesday night. Photo via Jennifer Daley. At his arraignment on vandalism charges yesterday for allegedly hacking at a Peaceable Street tree, Joseph Rizza was ordered detained pending a hearing on whether his newest charge violates his parole for hacking at another Brighton Center tree, the Suffolk County District Attorney's office reports. Read more. Can nothing stop the blade-wielding tree hater of Brighton Center? Apparently not, because D-14 officers arrested him again last night trying to kill a tree on Peaceable Street by hacking at it with a hatchet, just like he's been doing for more than a decade in-between his arrests and trips to Bridgewater for observation. Read more. UPDATE: A Brighton Municipal Court judge released him on personal recognizance for the newest case, but ordered him held at least until a Jan. 13 hearing, after revoking his bail on the April case, the Suffolk County District Attorney's office reports. 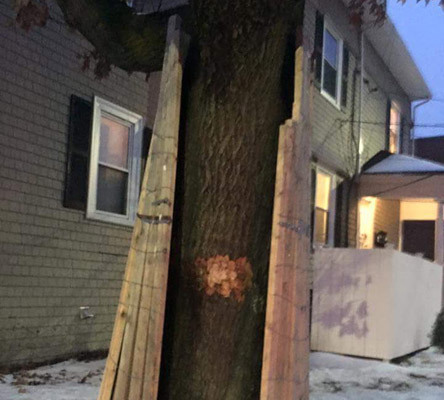 Boston Police report detectives on tree stake-out duty caught the alleged Brighton Tree Ninja attacking a tree on Peceable Street Monday evening. Read more. A correspondent forwards this photo of a newly gouged tree on Peaceable Street. He notes that whoever hacked at the tree first had to peel back the wooden boards the homeowner had placed there after a decade of attacks by a man in black who does everything he can to make trees die in the area surrounding the BPL's Brighton Center branch. Read more. BirdMachine reports new trees have been planted along Winship Street in Brighton Center, for the first time in a long time, because that's one of the streets the Brighton tree ninja has targeted for more than a decade with a blade with which to cut up trees so that they would die. Read more. Boston Police report arresting Joseph Rizza, 65, this morning after detectives say they caught him in the act of killing yet another Brighton Center tree - this time with a hammer. He was charged with possession of a dangerous weapon and five counts of willful and malicious destruction of property, police say, adding they continue to investigate the deaths of trees in the neighborhood over the years. A Brighton Center man who has been killing neighborhood trees for more than 10 years is being charged, again, with arborcide, this time along Winship Street and Academy Hill Road. In a police report, an officer says he responded to a Winship Street backyard on March 11 to find several large trees "severely damaged:"
The bark on the trees has been hacked off and the tree interior damaged to the extent that removal will be necessitated. Hank investigates the tree-killing ninja of Brighton, who has been rampaging for years through the streets of Brighton Center with a large blade, making sure trees die. Residents and police seem powerless to stop him and cry, help us, Hank! See it larger. Poster photo by Plunkett Prime Props. A man who dons a black ninja outfit and goes out at night with a long-handled blade is back on the prowl in Brighton again, slicing up trees to make them die. And now that he's killed all the young trees along one street, he's going after shrubs. Residents of Peaceable and Winship streets have put up wanted posters, while police try to collect enough evidence to convince a judge that the local resident, who's been killing trees for years, is a menace who needs to be sent away for longer than brief spells in Bridgewater. Sometimes he uses an axe, other times a saw. My landlord says his favorite tactic is to take a claw-hammer and strip a circle of bark off the tree all the way around the trunk. This destroys the tree's ability to draw water up from the ground, and it eventually dies.